This pizza starts with my no fail pizza crust and loaded with grilled chicken, crisp bacon, thinly sliced red onions, barbecue sauce, mozzarella and Colby-jack cheese. Good afternoon everyone. I apologize for adding the Potluck Sunday post so late in the day. I had to run to the doctor this morning so it really threw things off a bit. Better late than never right? 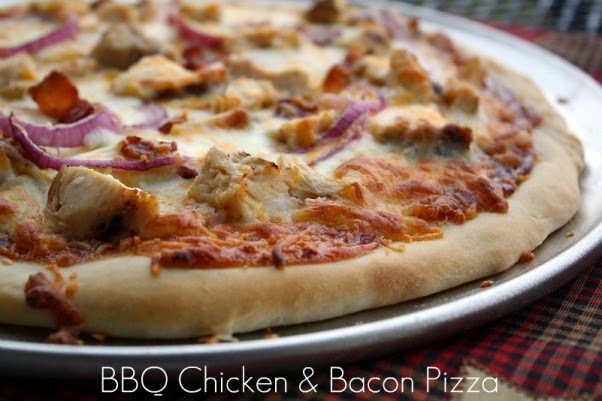 Today I wanted to share a recipe for a BBQ Chicken & Bacon Pizza. Last week was pizza night so I wanted to make my favorite Chicken, Bacon & Veggie Pizza. Well, I found myself running low on olive oil so plans got changed just a bit. I already had the grilled chicken and bacon ready to go on the pizza so I just made a barbecue pizza instead. I love BBQ Chicken Pizza's so I thought adding cooked bacon would make it that much better. Well I wasn't disappointed one bit because the combination of chicken, bacon, BBQ sauce and onions was perfect. Instead of using all mozzarella I added some Colby jack to the mix. In the end I'm kind of glad that I ran a bit low on my olive oil because it gave me the opportunity to try something different. Plus you can't have too many pizza recipes can you? Sorry for the drops of water on the plate, but it started raining on me. Preheat oven to 400 degrees. Prepare the pizza crust by dissolving the yeast in warm water and set aside until bubbly. In a large bowl mix the flour, salt and baking powder together. Knead the dough on a lightly floured surface until well blended. Place the pizza dough into a oiled bowl and turn the dough to coat. Let rest for about 20 minutes. Cover the bowl with dish towel or plastic wrap while the dough rests. Preheat the oven to 400 degrees. Spray your pizza pan with non stick baking spray or brush with olive oil. You can also use a pizza stone. Press the pizza dough into the pan. Pre bake the pizza crust for about 10 minutes and then remove from the oven. Add 2/3 cup barbecue sauce and use the back of a spoon spread the sauce all over the crust. Spread to about one inch from the edge. Top with chicken, bacon and onion slices and then both cheeses. Place the pizza in the oven and bake until the crust is golden browned and the cheese is melted about 10-15 minutes. I posted a link for the 1st time, and I can't figure out how to edit it. Where it said name I thought it wanted my name. The name of the dip is NOT Tina, lol. It's Holy Moses Dip. Let me see if I can fix it for you. That pizza looks great! Its making me hungry. Sometimes the best recipes get created when we get in a pinch for ingredients :) thanks for hosting! Hope everything is okay Tina! This is one of my favorite pizza flavor combinations - love it!! 2 of my favorite things on that pizza - how can I say no? We love bbq chicken pizza with bacon! Have you tried it on the grill?!?! AMAZING. Thanks for hosting each week; I appreciate the opportunity to browse such yummy recipes. This looks great! We just found your blog and think it's a great concept. We've been having a blast cooking with our kids too! The pizza looks great! I've just linked up a dessert! Have a lovely week! Hi, I am a new blogger, and this is my first time linking up to Potluck Sunday. I am bringing Steak Cubes with Butter Crumb Dumplings. I subscribe to your blog and enjoy it very much. Thanks for hosting the potluck. Well, it looks like I can't spell tonight, either. How did that "e" get in there? Happy Memorial Day Tina! That's a great lookin' pizza! I added my Mini Pecan Pie Muffins this week. Thanks for hosting! Stop by and add one of your recipes to my Melt in Your Mouth Monday! Wow, your bbq chicken pizza sounds incredible, and I cant wait to try it. Happy Memorial Day! YUM!! We LOVE to make pizzas on the grill. Will def try this & let you know how it was. (Im sure it'll be FANTASTIC!!) Thanks for sharing!! I used to think I was burned out on pizza, but then I realized I was burned out on the run of the mill boring pizza that is prevalent at every single purveyor of pie. Case in point, your BBQ Chicken & Bacon Pizza. That looks delicious and would satisfy several cravings at once - because who doesn't love BBQ and bacon? This should be submitted to a cooking contest because it would probably win. I love this recipe. I have a similar one and I use Gouda cheese. It tastes great!